Want to do a storage stress test to see what your newly bought All-Flash Storage array is capable of? 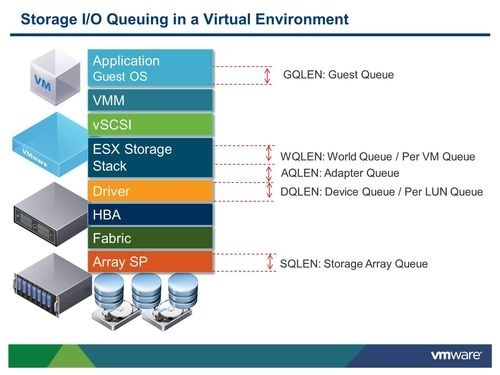 Perfect, then let’s have a look at IO queues within ESXi and how they influence your Storage performance! But before we dive in, as always, please read my Disclaimer first! Alright, let’s get started… Before we start tuning our IO queues and push our storage array’s to the limit, we first need to understand what an IO is and how it is related to IO queues. I will try to briefly explain the process of an IO, based on following scenario: We have an application, which is installed on a windows VM running on a ESXi Host which is attached to a Fibre Channel SAN and retrieves his storage from a traditional block storage array. This particular application wants to fully read a file. Now, whenever this stated application on the guest file system (NTFS in this case), wants to read this file, the IO device driver within windows will issue one or multiple SCSI Read commands through the virtual SCSI adapter after the the request has been translated in the file systems IO stack. Once received from the hypervisor, the SCSI requests sent by the guest OS needs to get translated and in rare cases even split by the ESXi IO stack until they finally reach the device driver and passes the HBA. Afterwards, they get send over the Fibre Channel Network towards the Storage Array where the whole game starts again in a similar fashion. Once the requested data arrives at the guest OS level, the IO’s get treated as completed. As described in the previous section, depending on what the application requests from the file system, a single file operation can consist out of 1 up to N IO’s. Since most of today’s disks/storage array’s still expose 512 byte sectors in form of Logical block addresses (LBAs), file systems usually create so called block clusters to reduce meta data overhead and to improve performance (locking etc.). In Windows for example, the default cluster block size is 4kb. That means, the smallest addressable disk space in the guest OS is 4 KB. One SCSI operation can consist out of N continuous cluster blocks. For example, a SCSI Read request, includes the starting logical block address and the number of consecutive blocks. In Figure 1 “Example file”, we can see a file on a standard formatted NTFS which is spread across 4 cluster ranges. Therefore, to fully open this file, we need at least 4 IO operations, but since the IO stack and the device drivers have maximum IO sizes configured and apart from that, it also depends on application and memory buffer mechanisms, we most probably need even more. To sum this up, to read this file, we need at least 4 IO operations, but most probably even more. As previously explained, whenever a file gets read or written, one or multiple IO’s needs to be issued. Normally, IO’s get issued in an asynchronous fashion. That means, whenever an IO request was issued, the operating systems as well as the hypervisor continue to work on other threads until the IO operations are completed and they can continue with them. During the time, a read or write request was sent until the data or acknowledges arrive, each of the requests occupy a “slot” in the different IO queues. So, let’s begin with the first IO Queue a request has to go trough after issued. On the operating system level, you’ll have different default queue depth’s based on the virtual scsi adapter you use. The LSI Logic SAS adapter for example has a default queue depth of 128 per adapter and 32 per virtual disk. On the other hand, the Paravirtual adapter has a default queue depth of 256 per adapter and 64 per virtual disk. In special cases you can even increase the queue depth to 1024 per adapter and 254 per disk as described in following KB Article. Now, if you have an IO hungry application or you just want to stress test your storage array, it is a good practice to distribute your workload across 4 pscsi adapters and 4 virtual disks each. If you like to increase this queue, you can do it with the following command. But since ESXi 6.5, the value must be smaller or equal to the “Device Max Queue Depth” which we will cover in the next section. In general, keep in mind this is also a per Host setting and should be applied equally to all Hosts in a cluster. The “Device Max Queue Depth” or the IO Queue per LUN is a setting in the HBA driver config and as the name indicates, describes the maximum queue depth per LUN. In general, this queue depth is active when only one active VM is running on the Datastore or when I/O Control is activated (will be discussed in the I/O control section). Depending on the HBA vendor, you’ll see different default values usually reaching from 64 to 128. As mentioned, this setting can be adjusted in the HBA drivers config. The process to do this, differs from from vendor to vendor as they use different drivers. Just follow the instructions in this KB article. Please note that you have to restart the host for this setting to become active as it is a driver/module modification. As you can see in Figure 5, the two port HBA is supporting a max accumulated queue depth of 2048. Okay, the “Device max queue depth” dictates the maximum queue depth and is active when only one VM is running on a Datastore, whereas the VMFS queue or the “Number of outstanding IOs with competing wordls” setting is getting active when two or more VMs are sharing the same Datastore. So far so good, but the whole thing changes when I/O control gets activated on these particular Datastores. As soon as I/O control is active, the queue depth on VMFS level gets ignored and Device queue depth is taken as a baseline. Whenever congestion occurs, I/O control reduces the queue depth in an adaptive fashion until the Datastore latency finally reaches a “normal” value again. I/O control detects contention either by a defined or intelligent observed latency threshold which needs to be passed. In production environment it is the best practice to activate I/O control anyway, but for stress testing purposes it doesn’t make a lot of sense. 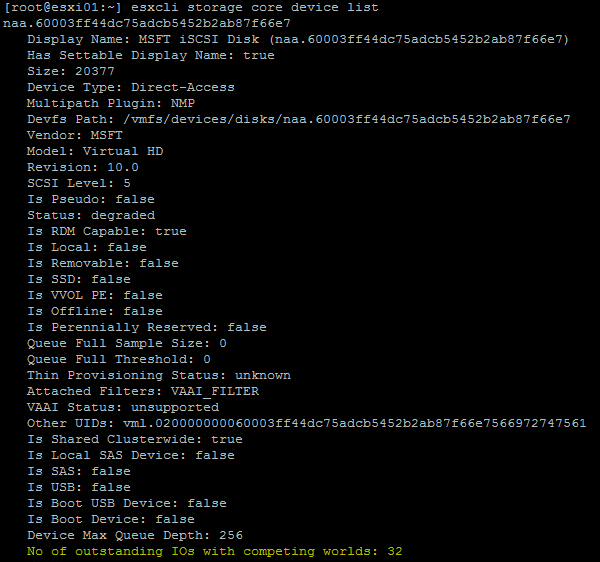 To check the current queue depth of a particular LUN after your configuration, go to ESXTOP and press “u” to get a list of all devices. In the row “DQLEN” you see the current queue depth. Apart from that, you have some other metrics where you can see how the queues are filled up during your tests. But keep in mind, with filled queues, the latency of single requests will also go up. But for stress testing this usually doesn’t matter as you most probably do ramp up tests where you want to see how many IOps my system delivering at what latency. One last point I’d like to mention here as well is, that the whole thing will change as soon as NVMe and/or NVMe over Fabrics will be fully adapted.